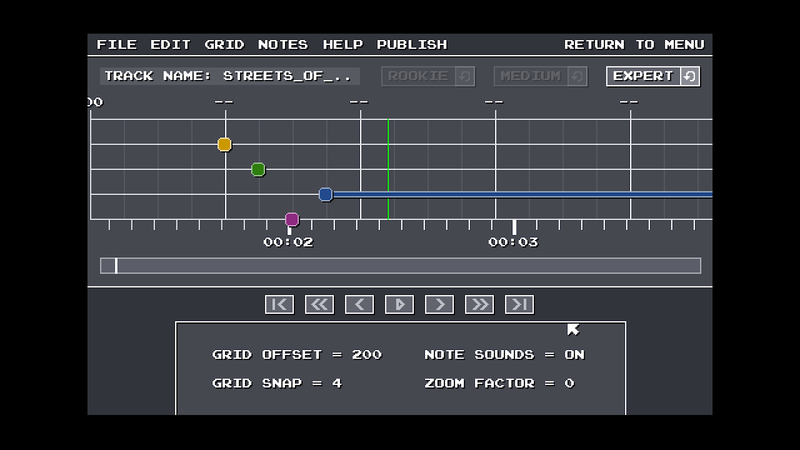 Chiptune Champion is a rhythm game similar in style to games like Rock Band or Guitar Hero except instead of using a controller shaped like an instrument to play the notes, you use a keyboard (as in, an actual computer keyboard, not a piano keyboard). As in all rhythm games, you'll see colour-coded notes fly towards you and it's your job to correctly hit the right notes at the right time. 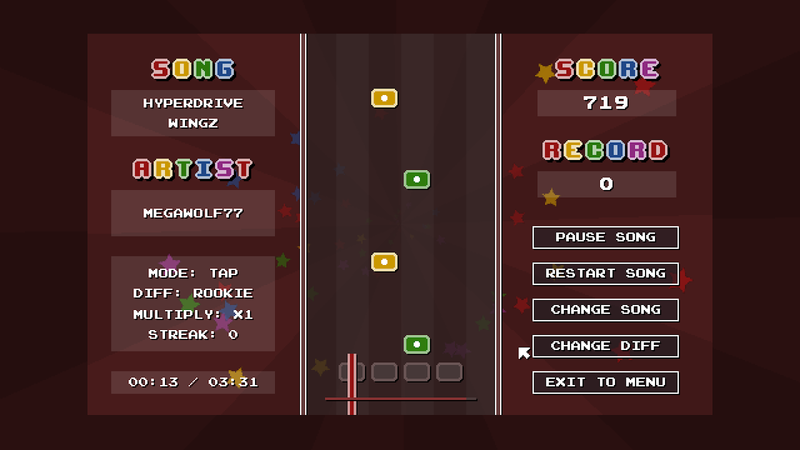 The game has three difficulty levels where the easiest only requires you to hit one of four notes whereas the other two modes require you to hit one of five: the harder difficulty levels also require you to hit more notes over the course of the entire track. The game was developed by a chap from Australia called Blake Garner and was released in 2016. Garner released an indie puzzle game called Entangle in 2017 but there hasn't been much word from him since then (there were a couple of tweets that mentioned he would consider retiring from game development if sales didn't go well). Steam recently had an Aussie Sale (during the Australia Day Long Weekend) which meant a whole bunch of games from Australia were discounted including Submerged and this game, Chiptune Champion. The game had been sitting on my wishlist for a while because I happen to like rhythm games. The game comes included with 40 official chiptune tracks you can play which is plenty to choose from. 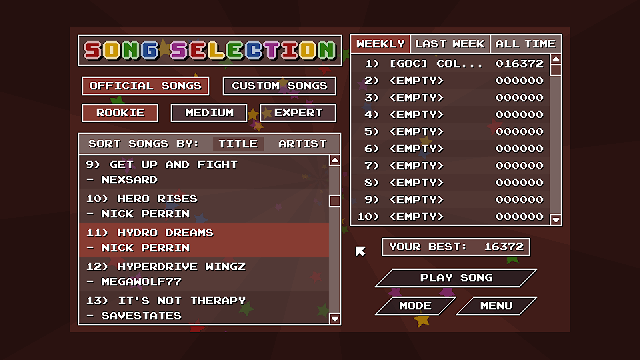 Another choice aspect of this game is the fact you get to play chiptunes – I don't think I've ever played a rhythm game before that specifically focuses on this genre of music (although Before the Echo comes close). The best feature of this game is the ability to create your own tracks that can be uploaded onto the Steam Workshop for others to play. I spent about an hour creating a track and it was relatively simple to do, even for a complete novice like me. However, keep in mind that what you're actually doing is just creating the levels (i.e. instructing the game when the player should tap particular notes) – so despite the fact you're working off an audio file, you don't actually end up uploading this audio file to the Steam Workshop (although you can notify others where to download a copy which is what is normally done). It's actually a great way for budding chiptune artists to open up their music to a wider audience; another reason to love this feature. Often when playing rhythm games such as Guitar Hero or Rock Band you're required to use special controllers; that's not the case with Chiptune Champion as all you need are a few keys on your keyboard and you're all set! As mentioned, I got this game during the recent Aussie Sale on Steam because the game is in fact an Australian one 😊. So, feel proud that you're supporting the Australian game development industry by buying this one. The game currently has a total of 14 Steam Achievements you can earn and is also integrated with Steam Leaderboards so you can compete against others to achieve a high score. Okay, this is really just something I'd add to the wishlist but each song you play has the same background animation. It'd be nice if for the track you were given the opportunity to customise what you see animated in the background as your track plays. The chiptune genre is a pretty obscure one but there are some big names such as Jeroen Tel, Martin Galway, Yuzo Koshiro, Chipzel and Jake Kaufman which I would've loved to have seen on the track list; although I suspect the reality is it's probably difficult getting some of them involved and at an affordable price. 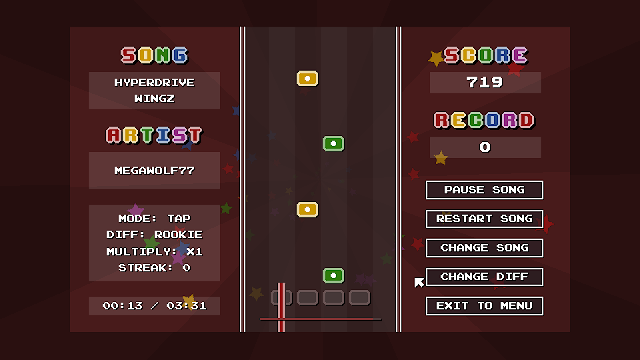 Chiptune Champion is a fun rhythm game featuring 40 official chiptune tracks with the ability to download more through the Steam Workshop or create your own using the track editor. There's not really much I can fault about the game except for some missed opportunities in order to expand on what's already a solid game: the potential to customise backgrounds wouldn't have gone amiss nor the release of extra official songs by prominent chiptune artists. Is the game worth $12.99 AUD? : For such a basic game, $13 is probably pushing it (especially considering you can get a rhythm game/RPG like Before the Echo for almost half the price) but since Chiptune Champion comes with a track editor and integration with Steam Workshop, this increases the potential longevity of the game, meaning it's definitely worth the asking price.